When the weather is turning colder we like a hearty, healthy soup chock full of fresh vegetables. It’s easy to make and very satisfying as the evenings get cooler and we like to prepare soups and stews for comfort and warmth. And I like to make a sufficient quantity so we have leftovers; (this freezes well too). If you have veggies from your summer garden such as zucchinis and tomatoes, this is a great way to use them. It is a thick soup; almost like a stew. You can, of course, thin it with additional broth, but we enjoy the texture and heartiness of it as is. Recently, however, I made this soup with red lentils from a company called “Preger” and found that the lentils never got totally tender, even with repeated cooking. First time for one hour, then, as I had made a large batch, we had leftovers, and cooked them for 1/2 the next time, then 45 minutes. Still not tender! I did add cumin, and allspice, and the flavor was very good, but still disappointing. Have any of you, dear readers, had this experience? Sauté onions til soft (medium to medium high heat depending on your stove, on stove top) in 1-2 Tbsp. oil (4-5 minutes); add carrots -sauté another 4-5 minutes; add zucchinis, sauté additional 2-3 minutes. Add another 1Tbsp.oil if needed. For a delicious meal serve with whole grain toast and a green salad with your favorite vinaigrette, (for a suggestion see ). When the weather is turning to fall we like a hearty, healthy soup chock full of fresh vegetables. It’s easy to make and very satisfying as the evenings get cooler. And I like to make a sufficient quantity so we have leftovers; (this freezes well too). 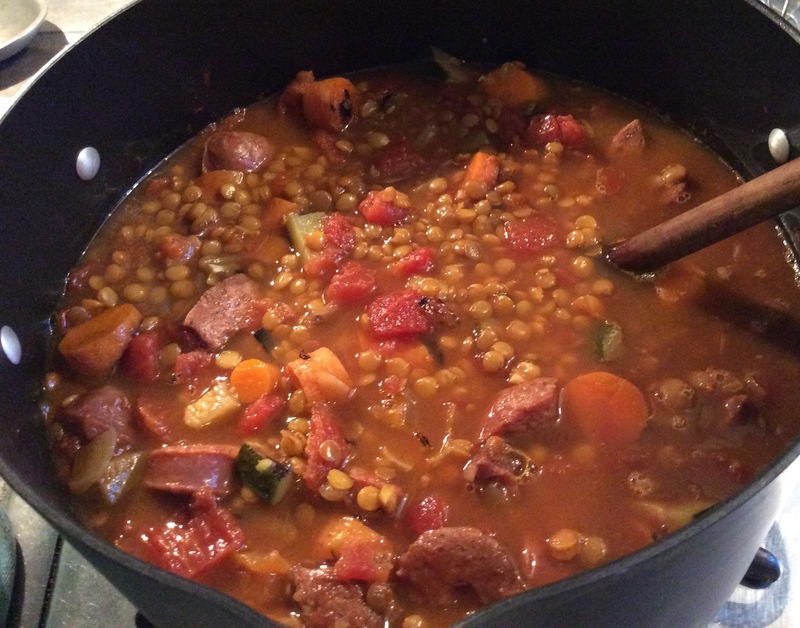 Recently I made this soup with red lentils from a company called “Preger” and found that the lentils never got totally tender, even with repeated cooking. First time for one hour, then, as I had made a large batch, we had leftovers, and cooked them for 1/2 the next time, then 45 minutes. Still not tender! I did add cumin, and allspice, and the flavor was very good, but still disappointing. Have any of you, dear readers, had this experience? Hope you don’t mind, but before I share this recipe I want to express something that has become even more clear to me; the difficulty it can be for folks who had totally different lifestyle and eating habits to make healthy choices–and how impactful that can be. What prompted this are two people I met in different circumstances. Rick and I were shopping for olive oils at a World Market store, and a guy started asking us about our choices, and that he was recently diagnosed with Type 2 diabetes, and was “trying to reduce sugars”– he had no idea about carbs – just that “sugar is bad.” He was buying two large cans of high carb snack foods (no sugar though), to substitute for sugary snacks. Actually I couldn’t help but suggest he try this blog (and especially read “The Journey” post). The second incident was a woman who came to our house to pick up bottles we were giving away (we’re in process of stuff reducing)–she was thrilled as now she had containers for her own salad dressing, sauces, and such non-processed foods she was making for the first time in her life. She was so excited as this was a huge change for her! It hit me strongly that these folks are representative of a large group of our population- who grew up with lots of processed foods and are used to eating one way, and are now faced with changing their diets- and what a major deal it is. I know this theoretically, of course, but it was reinforced! Made me realize even more how lucky some of us are to have grown up mainly eating in a healthy way, with an emphasis on fresh foods; (although my son went through a fish stick and tater tot phase–I’m not a total purist (<*). Makes me even more motivated to show that delicious, healthy eating and cooking is not difficult, not expensive, (cheaper that buying most processed foods, such as bottled salad dressings), and fun to do! 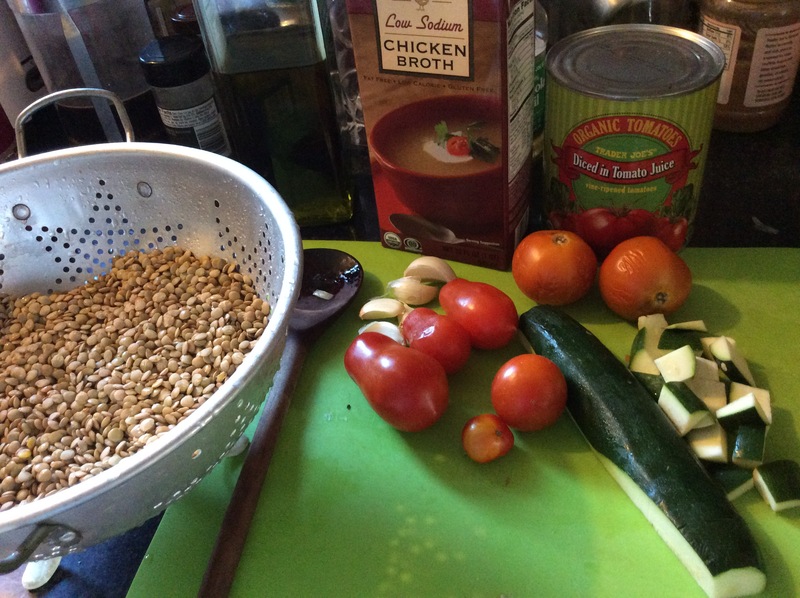 Stay tuned soon for the Lentil Veggie Soup recipe! Thanksgiving, however, unless there were medical emergencies, was a lovely relaxed time in our house. Mom took advantage of this break to use the turkey carcass to make a delicious turkey soup chock full of vegetables, garlic, wine and chunks of turkey from the carcass. It’s also easy to make and I’ve never had any better! I made it without noodles, but you could add whole wheat or other whole grain noodles of your choice, as now there is a good selection of these. 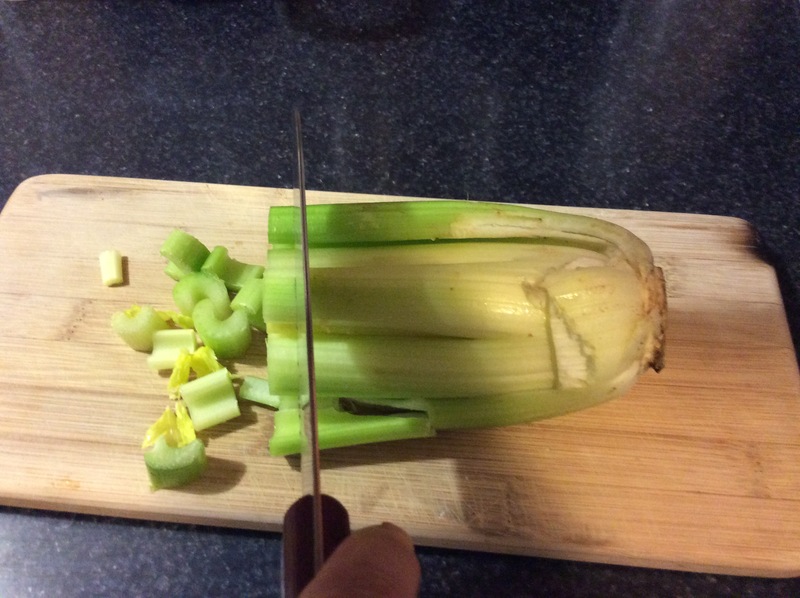 1 cup celery, chopped; using “Cook’s Illustrated” magazine’s technique: wash the celery to the point that you’re using, then instead of tearing off the stalks, cut from the whole (see photo). I’ve found it much more convenient and easy. 3-4 cloves of garlic- chopped fine. We love garlic; use as many to your taste. Turkey, chicken or vegetable broth to cover the carcass (approx. 1 quart). I use a combination of turkey broth I make from the giblets and a commercial low sodium chicken stock. Herbs; your choice, but make one a bay leaf. 2. 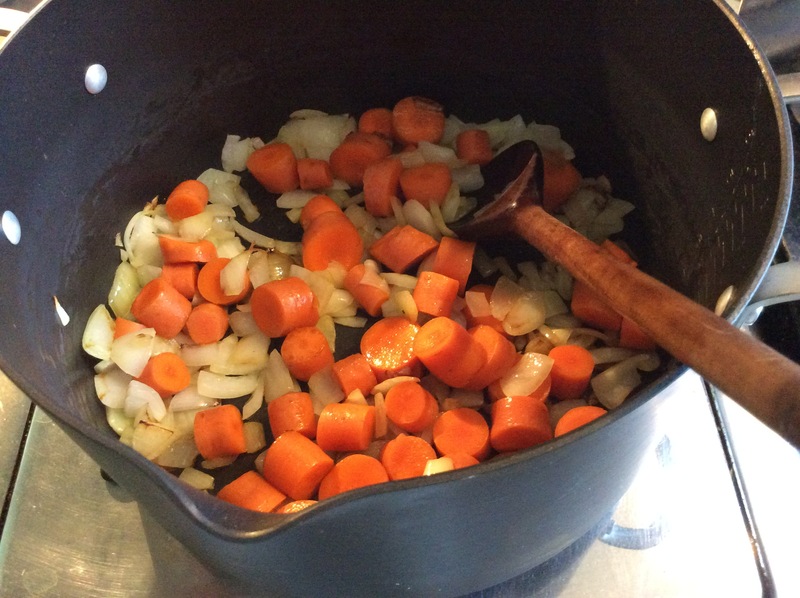 Remove the onions, add and sauté carrots and celery in the pan. After about 7 minutes add garlic and continue for approx. 2-3 minutes, making sure garlic doesn’t burn. 3. Put the carcass in a large Dutch oven or stock pot, add the vegetables and cover to the top of the carcass with broth. 4. Add wine, bay leaf and other seasoning. 5. Bring to a boil and then turn down to low to simmer for 45 min. to 1 hour, until vegetables are tender and meat falls off the bones; or longer, depending on your timing. 6. 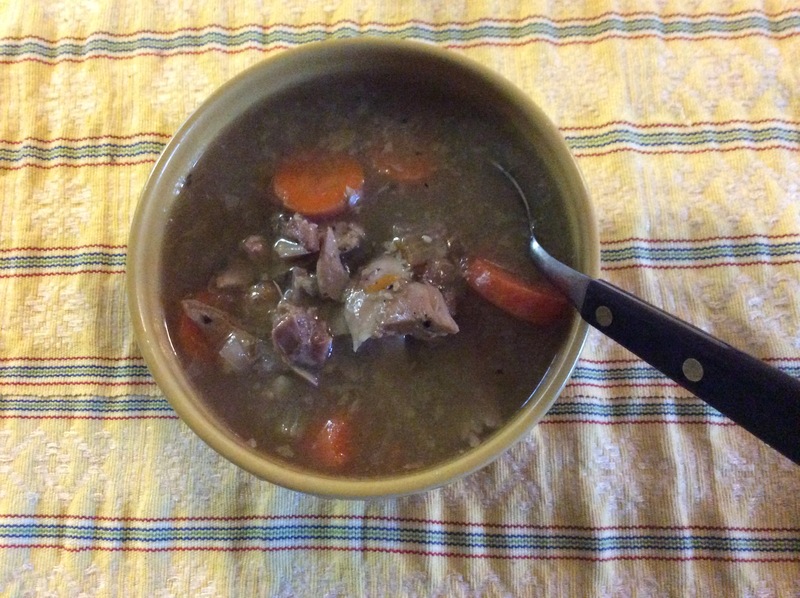 Remove the carcass from the pot and strip off the meat- chop and return meat to the soup. 7. Serve with good whole grain toast or noodles.